Work at the marina on Penny Hill has gone retro these days. One of the interesting projects recently undertaken at the yard was the renovation of a vintage 1920's ship. In 2004, the vessel, owned by the Bivalve Packing Company, was "wrapped in steel" to make it sea-worthy once again. Making another contribution to historic preservation, the modern-day marina offered its facilities to help facilitate the restoration of historic Fort Mott on the Delaware River in the early 2000's. Refurbishing the island fort's beaches required heavy equipment. At the Maurice River marina, now Cox Marina, cranes, trucks and other equipment were loaded onto barges to be hauled to the island. Just as in days gone by, tugboats were used to tow the barges for part of their journey. In another era, local shipyards were called to contribute to the defense efforts of the country. Dorchester's shipyards were enlisted in the war effort during WWII. Today the federal government - specifically, the Department of Homeland Security - called the Penny Hill marina back to "duty" when it enlisted the services of the facility to bolster safety efforts, for loading barges and other activities. Today the marina bears the name of its previous owners, Blanche Cox and her husband Ezra. At the beginning of the 21st century, Jack Milich was the managing partner of Cox's Marina in Penny Hill. He provided a glimpse at the operations that will usher in an new era along this section of the Maurice River. Milich said that he and his partners are operating the marina as a boat storage facility, with capacity for about 100 boats. The marina also provides a place for boat owners to do their own restoration and maintenance work on their vessels. To accommodate the large modern vessels fancied by today's boaters, the partners recently installed a new lift in the boatyard. 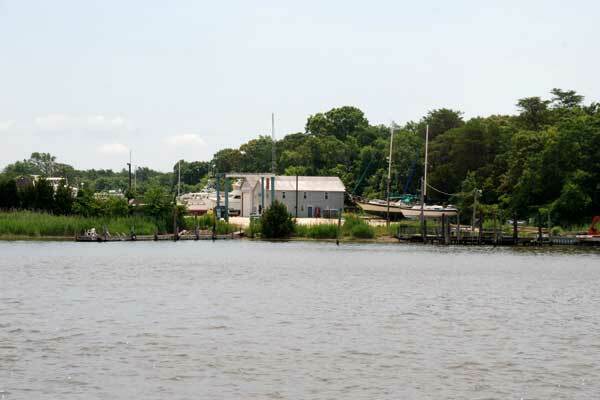 The activity at this marina is part of the ongoing efforts to "keep this end of the river in business," Milich said. Rules and guidelines are in place to work for a balance between economic revitalization and conservation efforts. The marina is required to pay (to the state) a water usage fee per boat. The federal Wild and Scenic designation of the Maurice River and its tributaries has been a bonus for the region, Milich agreed. The marina can provide an embarking point and parking for the groups of birders who board touring vessels, like the Bodacious, for a run on the river. More people are coming into the area for events like the county-sponsored Eagle Festival in February and Purple Martin Festival in August. The origin of this reach name? One story has it that Penny Hill is the burial site of an Indian chief. In his book, Indians of New Jersey, Herschel Schenck wrote that an old Indian chief was buried here, in a dug-out canoe. According to Schenck, the Indian had a "large neck piece he wore made from the old English coin know as a Penny." This Indian, Schenck wrote, was called Chief Mohoppeney. The chief's mark is found on land deeds along with the signatures of John Fenwick and William Penn. It is suggested that the name of this reach, Penny Hill, was taken from this regional Native American leader.